I confess… when I was in school, history was not one of my strong subjects. I would learn much more about history by reading historical fiction than I would ever learn from my school work. I enjoyed reading about the past, but taking a test involving dates and names… well, let’s just say I’m glad those tests are behind me! Here are some FREE ways to make history more fun and/or meaningful. 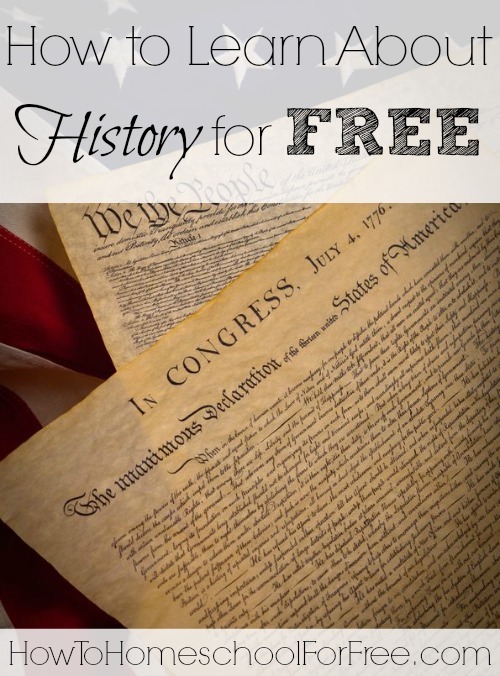 Guest Hollow has free American history lessons that can be used for grades 2-6, depending on your child’s needs. The lessons are available to download in .pdf files or Word documents, or you can view the lessons online. There is a daily schedule to keep you on track to finish in a year, or you can see how you can use this to supplement Tapestry of Grace, Winter Promise or other curriculum choices you might already have. American Heritage has a full K-12 curriculum. There are 3 levels of lessons: Elementary, Middle School, and High School. You can choose if you want the Texas Edition or the National Edition. Included in each unit is Character Study which I believe will satisfy any legal requirements for a citizenship course. Mosaic is a free world history curriculum by Bringing Up Learners. Mosaic integrates the study of history, geography, literature, poetry memorization, world religions and more, through the use of living books, websites, hands on activities, and other resources. There are 36 weeks of lesson plans, as well as a Yahoo group for families who already use the lessons. For the readers, G A Henty is a popular (especially among boys) author of historical fiction. Joy over at the Five J’s has written a post with some other links to help use these Henty books, which are FREE for the Kindle or Kindle apps. Student’s Friend was the first comprehensive Internet resource for teaching history and geography using online lessons. The website has free downloadable lessons, as well as a teacher’s lounge forum for discussion topics related to teaching the material. New this year is a free mobile app, available from itunes, for knowledge at your fingertips. Free World U is a free prek-12 online learning center. Not only does it have history for all grades, but it also is a complete curriculum. It is entirely online. Those who use the free program will have unlimited access to the virtual flashcards, which is the core of the curriculum. There is also the “Superlearning” option, in which classical music is played in the background. On a personal note, I might try this one myself in the history department to refresh my memory! For worksheets and lesson plans about individual events Teacher Vision has lessons by grade, theme, or popularity. There are quite a few lessons on September 11, for those wanting to talk about that this coming week. Just scroll down towards the bottom to the “Popular” category to see them. I hope this gives you some help! There are so many resources out there, so please chime in with your links so we can all learn how to homeschool for FREE together! It should be noted that Teacher Vision is not free. There is a cost for membership to download materials. Free Online Writing & Grammar Homeschool Resources!